Composed by Ilari Hylkil. 21st Century, Romantic Period, World, Folk, Children's Music. Score, Set of Parts. 62 pages. Published by Ilari Hylkila (S0.8103). 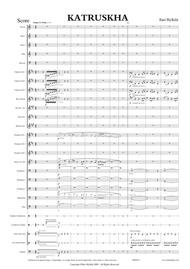 Katruskha, new world music for Concert Band. 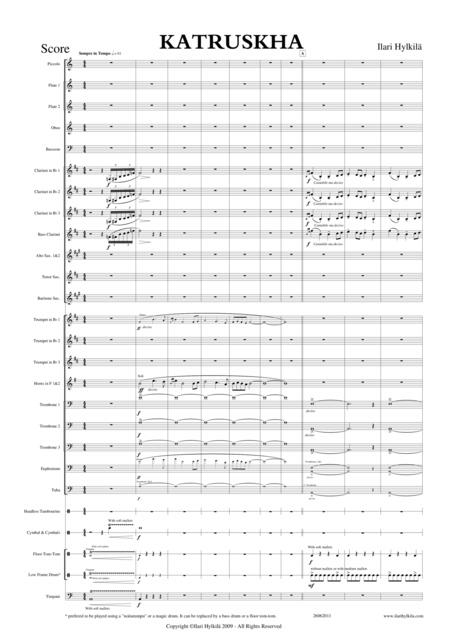 The file includes the conductor score and the parts.INSTRUMENTATION:Conductor Score (FULL SCORE)PiccoloFlute 1Flute 2Oboe BassoonBb Clarinet 1Bb Clarinet 2Bb Clarinet 3Bb Bass ClarinetAlto Saxophones 1&2Tenor SaxophoneBaritone SaxophoneBb Trumpet 1Bb Trumpet 2Bb Trumpet 3F Horn 1&2Trombone 1 Trombone 2 Trombone 3 EuphoniumTubaPercussion 1 (Crash Cymbals, Headless Tambourine, Floor Tom-Tom) Low Frame DrumTimpani. Our community band will play this for our next concert. Downloaded easily and printed up very nicely.